Do you use Math Stations in your classroom? I was hesitant at first when I started using Math Stations, but quickly found out how valuable they are! Math Stations (also called Math Workshops) is a system of different types of activities in the classroom for the students to complete based on the same topic. I have created the 7th Grade Math Stations BUNDLE to cover all of the Math topics related to grade seven and also cover all of the seventh grade common core standards. These Math Stations activities are helpful to students in that they review concepts, practice Math, apply Math, and read about the Math in the real world. There are many different ways you can use these stations as they are versatile for the teacher to pick and choose which ones you want to use on any given day. If you already use Math stations in your classroom these can complement your set with additional practice and applications for students to review Common Core Standards. 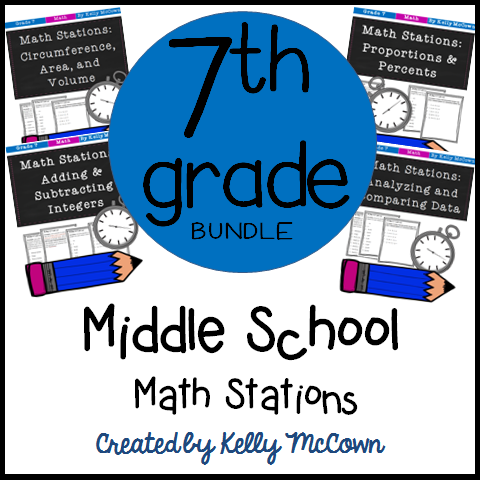 This Middle School Math Station Bundle is a COMPLETED BUNDLE covering ALL 7th grade Common Core Standards! 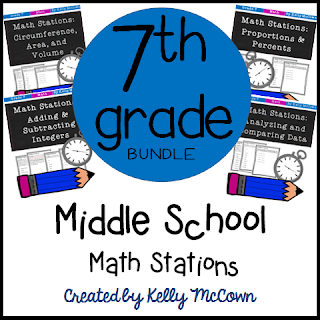 This Bundle is 20% OFF the original price of all total math stations. I know this can be a great resource for you and your students to be actively engaged in the learning process. Students gain self-confidence and own their learning process when they are given the chance to work independently on Math Stations.